As learned in the last article Tomatoes – The Beauty of Self-Pollination, tomatoes are considered “self-pollinating” as they grow flowers that have both the stamen and the stigma (males and female parts) on the same blossom. 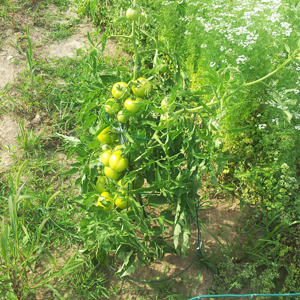 Under normal circumstances, tomatoes are pollinated by the wind or bees. In many circumstances, the wind and bees may not cooperate at the right time causing blossoms to drop off thus reducing the number of tomatoes that develop. BugVibes™ was originally designed to chase away Japanese beetles by attaching to a plant or tree and using mechanical vibrations to chase them away. In this experiment, we tested BugVibes™ to see if it would have an effect on stink bugs, tomato horn worms, and pollination. To see if it had any effect on pollination, it was first tested on flowers. BugVibes™ vibrates the plant for a gardener, allowing the pollen from the stamen to fall on the stigma and pollinate the plant. See an example of this process taking place with BugVibes™ here: https://www.youtube.com/watch?v=h4rmAd-c-Pw. Some gardeners hand-pollinate tomatoes. Convenience of this process often poses a problem to working gardeners, as the optimal time to hand-pollinate is midday when pollen is shed the most. The process is also not easy; however, it can be quite effective. This further contributed to the idea that BugVibes™ may be an effective form of pollination. If testing is successful to increase yields, installing a BugVibes™ may be far less time consuming on the gardeners than going out several times a day and hand-pollinating an enormous amount of flowers on each plant. To ensure that BugVibes™ were of benefit to gardeners in the hand-pollination process (as their main use is for controlling pests), we installed them on two tomato plants of the same variety, planted at the same time. 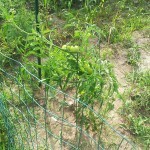 During the process, the two tomato plants were given equal amounts of fertilizer and water. One was grown with a BugVibes™ device and one without. The results are shown above. The yield of tomatoes from the plant on the right (using BugVibes™) was almost 3x more than the plant on the left (without BugVibes™). More extensive testing is needed but early results are very promising.